Carver Jim Heaton of Haines, Alaska, calls the adze his "bandsaw on a stick." An adze with truly proper geometry is a very effective means of rapidly wasting wood. It is also an accurate way to work to the line without wasting time on unnecessary knife strokes. Properly designed, an adze will have such control that you can hog with it or take chips the thickness of this page. This control comes in part from our spherical grind. This means a slight tip of the wrist has you going from tiny controlled chips to hogging big chunks. The adzes available through regular suppliers have such bad geometry they are almost unusable. Four Adzes, ready to go. From top to bottom: 2" Lip adze, Sitka gutter, Sitka straight, Texture or Finishing adze. The full size Sitka adze is our most popular seller. The gutter form allows cross-grain cuts, making it a good choice for roughing out and hollowing. The straight adze is used for establishing the planes in mask carving and the like. The straight blade allows real control over the work. Correct grind angles mean it is not inclined to be "sticky" in hogging. You could say that the gutter adze is best for inside, concave work, and cross grain carving, while the straight adze is best for outside, convex work, flat planes and carving with the grain. The truth of the matter is that there is no one perfect tool for all situations, and the two adzes we make, gutter and straight, complement each other. I'm not sure how long a serious carver could get along without one of each. I know I can't. Although this tool is smaller, it is not a toy. A nicely balanced adze wonderful for small work and accurate strokes. A real pleasure for young carvers and those with less powerful wrists. These are popular in both gutter and straight forms. This is the tool for applying the finish texture that is characteristic of Northwest coast work. The cut-away haft allows the adze to spring. A fun and easy adze to work with. Shipped somewhat stiff, you can lighten up the spring area according to your desired action. 2 1/2" Lip. A very versatile tool. There is nothing like a lip adze for wasting large amounts of wood rapidly. Once you know where you are going, there is no sense mucking about in getting there. Most of my professional carving friends use a lip adze for even smaller mask-size carvings. These sophisticated tools have a slight radius to the cutting edge and the lips are angled out some to keep from "stuffing the chip." I am now making the "light lips" of 5/32" material. This adds an ounce to the weight of the heads making them decidedly more aggressive tools when heavier wood removal is called for. This small amount makes a real difference in the tools balance. To handle the extra weight I have also added some to the power of the haft. Both the 2 1/2″ and 3″ are real wood eaters for wood carvers. Since I don't carve everyday and I often use the corners of the lip I like the 2 1/2″ best. Although I have beefed up iron and haft for these you will still need to keep the tool sharp and cut, but not pry your chips. Our lip irons come with a thermal formed Kydex sheath, perfect protection for that long edge! 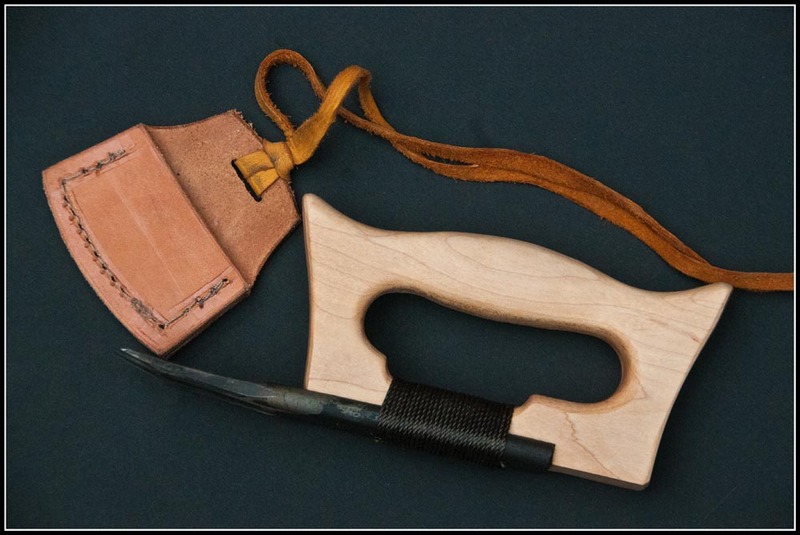 For your personal safety, It is imperative that you know how to properly put on and remove your adze sheath. Please check out our short video on this subject and others on our 'video page'. It is definitely worth the few seconds it will take, and may save you some future agony. Our sheaths are designed to protect both you and your adze iron, but it is ultimately up to you. That's a silver dollar for size reference, not a quarter. If you are looking for two handed log working it would pay to go to Ebay. You'll find yourself a 4 1/2″ shipbuilders' lip adze there for reasonable price. Unlike most of the smaller adzes you will find in the wood tool catalogs most of these tools have decent geometry. I used to supply 4″ irons but I could not begin to compete with the price of an old one. Craig's List and Ebay, check it out. The traditional adze of the southern Northwest coast peoples. Today this tool finds favor among many Northwest carvers—some use it extensively. The D-adze can be used for shaping or surfacing and it will reach areas unavailable to an elbow adze. Great for laying down a distinctive texture, especially on larger work. Our D-adze iron is a monster weighing most of a pound to help transmit power to the work. The D-adze iron is available only with a leather guard. Another view, with Leather Guard. These guards are hand sewn of heavy bark-tanned leather just like our knife sheaths. A leather thong attaches it to your adze. The adze kits include a leather sheath—the adze irons sold separately do not, with the exceptions of the D-irons. Typically my customers assure me they will make a great sheath themselves—rarely do they do so. Just one bad nick in an edge can cost you more than a good sheath. Order a sheath when you order your iron. You'll be glad to have it. Our adzes are available in a variety of ways. To save money you can buy an iron only. These come with instructions to help you make your adze from a natural tree crook or sawn blank. Our kits contain the iron with a heavy leather guard, a roughed out rock maple haft blank, a length of twine and instructions. Or if you have time constraints and/or a willing budget, you can buy the tool hafted and ready to carve. All the made-up adzes come with a heavy leather guard and instructions on use. These adzes have awesome balance and are a pleasure to own and use. For the "ready to carve adzes" I am now adding a texture to the grip area of the haft. They are mo-betta! The photo doesn't really show the texture, but it is there. The photos in this section that pre-date my adding this texture do not have the ring at the top of this gripping surface. Presently I am adding it to all finished adzes. Our Adzes, adze irons and kits all come with a 12 page booklet with 29 photographs and 3 pages of drawings which includes full size adze haft templates. These materials cover adze use, sharpening and hafting your adze iron. Our adze haft blanks are Eastern Rock Maple. I have added to the value of the adze kits by rough shaping the haft. This gives the carver something to go by when finishing the shape. It is natural for a person new to these tools to be somewhat conservative when shaping the haft – to make these tools really sweet there is a lot of wood that must be removed before the carver will end up with a tool with the right balance and correct functionality. My pre-shaping will get you to where you need to go much faster. All of the kits include haft, iron and heavy duty leather sheath and a length of nylon twine for the wrapping. If you are ordering an iron only you may request a length of twine to go with it. Spools of twine are available on the 'Tool Making Supplies' page. There are so many possibilities it can be confusing—it needn't be. We sell two types of adze: the elbow adze and the D-adze. Most of the advantage lies with the elbow adze. I do not recommend you buy a D-adze unless you know why you want it. Gutter adzes are good for wasting wood with and across the grain. 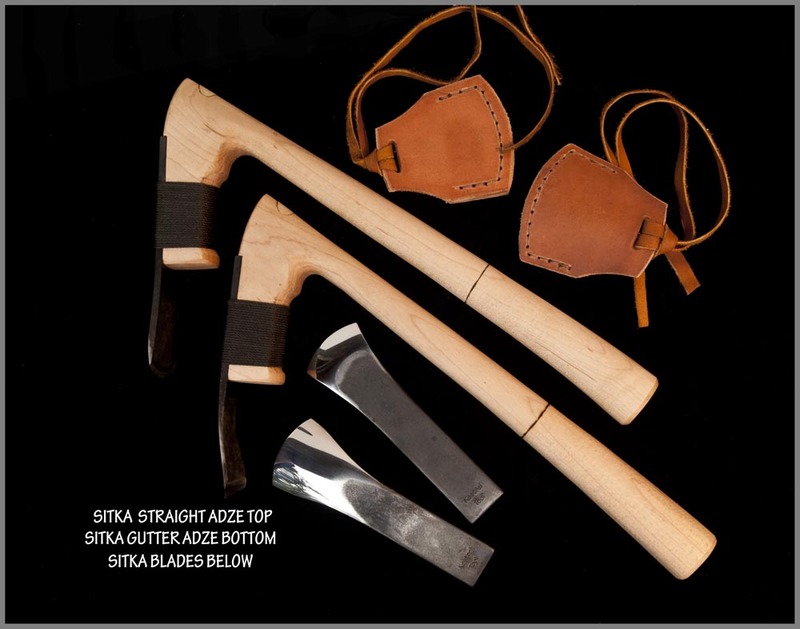 If I was starting with one tool, I'd choose the Sitka Gutter adze. Straight adzes are somewhat more traditional on the coast. Many carvers use them almost exclusively; mask makers consider them essential. They are especially good for flat accurate cuts. An adze does not rebound like a hammer on a nail, so it is a mistake to buy too heavy an adze. For this reason, smaller people and those with less powerful wrists should stay with the baby adzes. Fast accurate cuts are better than wild flailing with a heavier tool. Kestrel Finish adze, D adze, baby gutter, baby straight, sitka straight, sitka gutter, and 2 1/2" lip adze. I cannot insure these tools against abuse. Fit up the iron if you are making from a kit: that means check the surface to make sure the iron sits flat to it. I actually fit it so it makes contact towards the front contact point with the wood and again in the back – the center I leave just a tiny gap. You check this by holding the assembly up to the light. What happens when I put a really tight wrap on the tools is the center pulls down slightly into the gap and so really holds it tight. If you don't find it easy to do this at least make sure you have good contact so the iron doesn't rock around and it fits tight front to back. Keep your tool sharp and don't pry with it (or with any of my tools!). If you do this you will be using the adze for years. Yes, I'll repair or remake your tool as long as it doesn't show signs of real abuse. An adze comes in here for repair about every 4 years; don't be afraid to send yours in even if you feel you may have screwed up. I want you to be using and enjoying my tools and will help you do so all I can. Call for advice on shipping one back, I'll need the whole adze. Thanks. Pole by Tim Runyan. Happy Adzing!